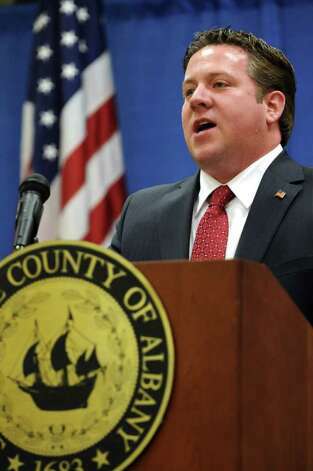 Albany County Executive Dan McCoy will address the first Albany Roundtable luncheon of 2013-2014 on WEDNESDAY, October 9. Albany Roundtable luncheon meetings are held at the National Register-listed University Club, 141 Washington Avenue at Dove Street in Albany, and are open to the public. County Executive McCoy was sworn into office on January 1, 2012 after serving twelve years as a County Legislator representing the 10th District which contains parts of Albany and Bethlehem. As a County Legislator, Dan was unanimously elected by peers to be the Chairman and served in this capacity for 2 years. He also served for three years as Chairman of the Albany County Democratic Committee, the youngest person to be voted to that position. Dan's priorities for his administration include fostering economic development opportunities through a Local Development Corporation; launching a small business incubator in the County Building to provide low cost space to fledgling companies looking to grow within Albany County; expanding the Domestic violence court within the City of Albany countywide; restructure and improve the healthcare delivery administered by the county and aggressively address the County's accumulated operating deficit. McCoy is expected to discuss the challenges of Albany County nursing home and providing future services to the aging population in the County, in addition to touching on other issues important to the residents and business community in Albany. The cost for the luncheon is $20, which may be paid at the door. The Roundtable is also offering its guests the option of paying in advance with a credit card. The University Club will serve a hot and cold buffet from 12:00 noon to 1:00 p.m., with the program commencing at 12:30. Reservations for the October 9 luncheon are required by October 8, and may be made by prepaying online, by calling 518-431-1400 (the Albany Colonie Regional Chamber of Commerce) or by sending an e-mail to albanyroundtable@yahoo.com.